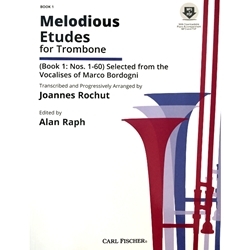 A staple in brass methods, Melodious Etudes for Trombone, Book 1 has been re-engraved, corrected by pedagogue Alan Raph, and printed with a lay-flat binding for ease of use. Additionally, Bordogni’s original piano accompaniments, written specially for the vocalises, are presented with these etudes for the first time. As a bonus, the edition now includes downloadable MP3s and printable PDFs of the original piano accompaniments, performed by Rae Moses. These etudes, transcribed from the vocalises of Bordogni, have been specially prepared for use by trombonists in order to perfect their overall technique and in particular to develop style in the interpretation of melody.